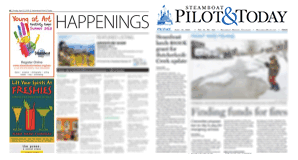 The Main Street Steamboat board of directors believes the Yes2Air program will strongly benefit our community. The program will allow for expansion of the summer flights while stabilizing our offerings in the winter. Being able to provide consistent air service to our community is beneficial to residents as well as guests. We have seen our economy grow with our air program with the addition of nonstop flights to the west coast and this winter will reap the benefits of having a low cost carrier such as JetBlue join our ranks. Without this initiative, the current reserves supporting this program will likely be depleted by the end of 2019. If the Yes2Air passes, it will be funded by three sources. The first will be the ski resort, raising their contribution to $1.6 million. The Local Marketing District will add $1.6 million from an accommodations tax that is funded entirely by visitors. The last source of funding will come from the Yes2Air tax. This 20 cent tax on every $100 of taxable goods sold will be paid for by visitors and locals alike, generating an estimated $1.3 million. Main Street Steamboat feels that this is a fair distribution of responsibility with the community at large having the smallest contribution. It is important to remember that we, as a community, are dependent on sales tax to provide most of our city services tying the success of our local businesses to the overall success of our city. Shopping local is more important than ever, but we cannot sustain our way of life without our visitors. Guests flying into Steamboat spend an average of $1,345 during their stay. This is significantly higher than a guest driving to Steamboat. These dollars go directly into our community via restaurants, retail stores and lodging and pay for essential city services through sales tax. We believe that the Yes2Air tax is vital to our community and urge you to vote “yes” on 2A.